How many words will it take to describe the last week? Merry Christmas everyone (who I did not see in the past 3 days)! I am in NY with the parents and family and having a very good time. Last week was busy trying to get end of year stuff done. I’m going to be working Thursday and Friday but I don’t know who else may be so I knew last week was my last real shot at getting things done in 2007 for work. As a result, I worked later and more constently all day then normal leaving zero time for blogging or reading any of my favorate blogs. Friday started the Christmas season with a gift exchange at T&K’s. They both liked their gifts and the kids really liked theirs and they are a very hard family to shop for. Lars go Scott a T-shirt from Cafe-Press that he was very very excited about so I was expecting something cool or different and it ended up being a XL black t-shirt with two yellow ovals on it…. It is apparently from a comic they both read and Scott did in fact really like it but I told him next time he wanted yellow ovals on something let me know, I can take care of that (as could the average 10 year old). Saturday morning it was snowing as we left… not a great start to a two airplane day, but we were early enough that we really only had a 20 min delay at MSP and that was because Chicago was having fog delays and they didn’t want to circle waiting for their turn to land. We got in and out of Chicago without a hitch and to NY about 30min after expected arrival time. The AA termanl at JFK is really nice, very modern and clean and way better then the old terminal we usually fly into. Dad was there to pick us up and the weather here was perfect and hardly counts as winter. The news said that most flights were canceled that afternoon and the next day so I’m glad we got out just in time. Sunday was family picture day and I hid the bump behind my sister so I look pretty normal. It took almost 3 hours from arrival to departure so it ate a big chunk of the day. The photograpther had a crush on Josie and they had hung out over the summer, poor guy had to act all goofy to get the kids to look cute and his favorate catch phrases were “Say POOPIES!” and “Stinky Feet!”. He really did not have a shot with Josie before but had even less (-10) by the time we left. Lars and I were invited to Bev’s for a dinner party at 5 and there was just enought time inbetween to stop into the yaucht clup with parents and say hello to that crowd before going to the party. I was extreemly surprised to see so many of my friends there including Hailey who I had not seen in almost 10 years because we just kept missing eachother with travel and she also lived in Alaska for a couple of years. Anyway, the party was very fun, the food was great and my Mom had told me to ask everyone around to her house for coffee and visit since she had not seen any of my friends in ages (only slightly suspicious) and when I mentioned it they all agreed to come (slightly more suspicious) and when we got back to our house and it was full of baby shower! There were obviously some hints but it is much more fun to be surprised and I was. We got lots of nice baby stuff inclueding some reeeeeaaaalllly cute girl clothes so my HS friends are voting girl. I need to get some baby spesfic thankyou cards when I get home. Christmas eve was busy with final prep and a church and a party next door and general anticipation for the big day. Christmas morning was all adults (plus one fetus) because Sinead sister and husband and nephews went to inlaws for eve/day so we all got to sleep in. Dad served Mamosas in crystl glasses and we all opened a bunch of presents. I think everyone liked everything and it was a fun morning. We were lazy for most of the day and did a big clean up before the 30 other family memebers arrived at 6pm. We set the table for a huge amount of family, I’ll have to get a picture from one of the aunts who were taking them. Dinner was tasty and fun and loud and we all fell asleep way to late after more presents and dessert. Boxing day we recovered from christmas and went to a party at my Grandmothers. Sinead and kids finally arrived after battling getting lost and bad traffic but it was fun to see TJ house the humas and B actually eat a bunch of blue cheese, I am glad to not be incharge of their diapers today. We did Christmas take 3 with the little boys and then stayed up too late again. Last week work was moaning about the lack of Christmas candy… today there are no complaints. I have no idea if things are slower or memory is foggy but today we are inundated with candy and summer sausage, enough that I’m feeling a bit queasy. Tomorrow is my birthday so maybe I’ll bring in something healthy to try and offset the sugar rush. Not really that fun but better for everyone. This weekend was busy, Saturday I got some cleaning, laundry, and errands done and then went to a Christmas party that night. Sunday Lars and I went appliance shopping and the fridge we wanted was on sale enough that we are getting a dishwasher too for a combined total of what we planned on spending on a fridge. Yeah Appliancesmart! We also went to two different malls, the Maplewood mall in search of jeans that actually fit Lars (not easy) and the mall of America to get the last few things for Lars’s family, I need to pack them tonight and mail tomorrow. ALL DAY shopping got to my poor pregnant back and by the end I was really feeling my extra 15 pounds. We went to motherhood maternity on the ongoing quest for a dress for Christmas and I was talked into the belly brace by Lars and the sales lady and it really does help a lot. It is like a weight belt that gives the belly and back support and it makes both feel much better. I liked it so much I wore it out of the store, and, as a bonus we even found a good dress. The unintended side effect of the belly band is that baby thinks it is a foreign invader imposing on his/her space and has been spending a lot of time giving it kicks and punches. I don’t mind too much because its nice to know the bump is healthy but I have a feeling I might be annoying the bump with this restriction on space. Today I did all Christmas card inserts and labels and tonight I will assemble and tomorrow hopefully mail. I’m not sending them to people I normally see, mostly far away family so there are only about 25 so here is the picture that I’m including. I worry that I look chubby but I suppose people will have to understand. Tonight and this week have a bunch of potential plans but many things are up in the air so I’ll do what I can do when I can do it and what does not get done will just wait! I hope everyone enjoys my new format for a bit, I thought it would be fun to play with one of the holiday templates but it has a few oddities with the sidebar so I’ll be switching again after Christmas. I added the baby counter (and it sticks out funny) so I had to move to having one post per page so if you don’t visit too often use the previous post button at the bottom to navigate through. I think I have finally recovered from the weekend. The event itself was very fun but the logistics were a bit too much. I combined a work trip on Friday with the event so I had to have all packing done on Thursday and Friday I got up at 5am for the first leg of the trip. Flying to Appleton WI was uneventful except we were in a micro mini plane with mini seats but it got us where we were going. There was one annoyingly loud guy who talked the entire time up to the point where they forced him off the cell phone and then he immediately called them back the second we landed. I think he was leaving a voice mail the first time because he said exactly the same thing during the second conversation with the addition of “did you get my message”. I can’t help but think that since we were only on the plane for an hour between 6:45 and 7:45 the chances were slim they got his message. 2 hours more driving back north to the site to the fleabag hotel, I’ve seen worse but this one was pretty bad. Next year we are going to the comfort inn (like last year!) I only went with the stupid Super 8 because it was recommended by the site and we missed all the after event socializing last year. Event was hectic but fun, the tournament I was hostess of went very well with 32 combatants and I think everyone had a good time. Heather was impressed with our guys, both how good everyone looked and how organized it was. At court (long court) we declared for the East officially and I think Lars and Konrad did a good job – Konrad told everyone how he has been here many times in the past years and he needs our aid and Lars replied by telling everyone how Konrad brought him to his first event and was there the first time he fought, they have fought together, got knighted together and grown up together and there is no way he could deny any aid Northshield can bring. 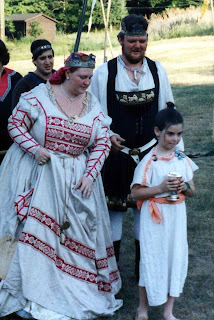 I think it is really cool that they are both on the throne together and I think Northshield will have an awesome time at pennsic if they are open to it. The next day I finally got everyone out of bed and we went to Chicago to see the art museum. The drive was not as good as it should have been but we got there with a few hours to spend. the museum was really cool, lots of the famous originals of famous artists but also a ton of not famous pieces from famous people (Monet, Picasso…) that I had never seen before. It was a shame we had to rush it but our planes were (allegedly) supposed to leave at 6:30. As you might have guessed, our planes did not leave on time… Konrad and Heather were delayed until 10pm and ours was canceled due to weather. I saw no bad weather personally but who knows, I doubt they cancel flights for fun. They offered to put us on standby for an oversold flight at 9:45 or a 9am flight that routed through Detroit making a 1 hour plane ride into 3 so we opted to cancel at 6 and go rent a car. Easier said then done but after the second try we found a car and we got to MN around midnight. Last logistical issue was that we left one car at the airport and the other car at G2’s so we had to return rental car #2 of the day, get car #1 and then car #2. Home in bed by 1am. Needless to say I did not feel great and rather then risk getting really sick I took the day off and did some homework and work work and slept alot. Today I was much better for it and ready to keep going with the week.